For most, the mention of My Fair Lady brings to mind images of Audrey Hepburn singing "I Could Have Danced All Night," or drawling "the rain in Spain stays mainly in the plain" to Rex Harrison. Watching the new production at Greensboro's Triad Stage, however, one might easily forget having ever seen the Academy Award winning film version, as each player slips seamlessly into the iconic roles, making them wholly and completely their own. The plot is, of course, the stuff of musical theatre legend. Professor Henry Higgins (Michael McKenzie, who recently appeared in the Netflix original series, House of Cards) bets fellow linguist, Colonel Pickering (Bill Raulerson), that he can turn Cockney flower girl Eliza Doolittle (Julia Osborne) into a proper lady in six months time. Eliza's language skills, however, turn out to be more difficult to improve than Henry expected, but over the course of those six months, the two adversaries will forge a much deeper connection than either of them could have ever imagined. 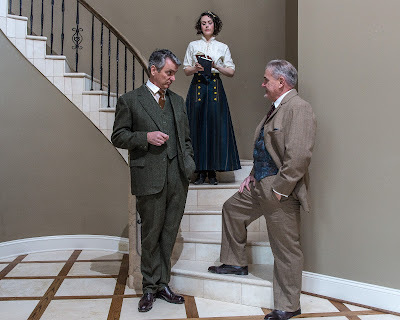 Michael McKenzie (as Henry Higgins), Julia Osborne (as Eliza Doolittle) and Bill Raulerson (as Colonel Pickering). The leads are all spectacular - Osborne is completely winning as Eliza,d and McKenzie walks the fine line between lovable cad and complete jerk that is required of Henry Higgins. Ultimately, however, the show really belongs to the supporting players, most especially the incomparable Rosie McGuire as Mrs. Pearce, Higgins' faithful housekeeper, and Gordon Joseph Weiss in the hilarious dual role of Eliza's father and Henry's mother. Weiss manages to transition between the drunken two-step of Mr. Doolittle to the haughty megalomania of Mrs. Higgins with great comic skill. Both are Triad Stage regulars, and they shine here again as always, walking away with the scene in their pocket every time they appear onstage. Nick Cartell also brings the house down as Eliza's starry-eyed suitor, Freddy Eynsford-Hill, whose rendition of "On the Street Where You Live" is a show-stopping highlight. Even without the aid of a full orchestra (the actors are accompanied by two pianists), Alan Jay Lerner and Frederick Loewe's immortal score really soars. The folks at Triad have also pulled out all the stops with the set and costume design. Lindsay McWilliams' costumes are absolutely stunning, especially in the Ascot scene. The ladies' dresses and their complimentary colors (not to mention Eliza's epic hat) are a dream, and the staircase that descends to the stage looks like something out of Gone with the Wind. As a side note, casting director Cindi Rush also worked on Patrick Wang's magnificent film, In the Family, so Triad really isn't kidding around here. 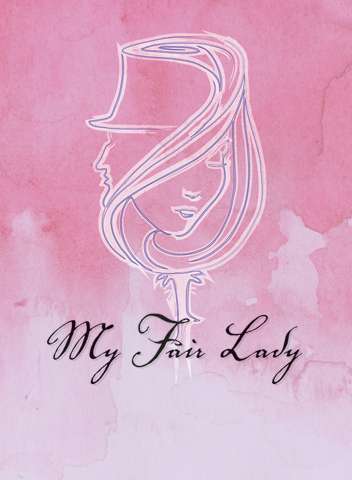 For all the glamour of the sumptuous production, what really makes My Fair Lady shine is the dedication of its cast and crew, and the direction of Bryan Conger. Musical theatre is often very broad and presentational, but this cast manages to find the truth in their roles in a way that is very rare indeed, reminding us that this isn't so much a traditional love story as it is a story of unlikely friendship. It is at the complete opposite of the theatrical spectrum from their production of Tennessee Williams' Kingdom of Earth back in February, but its no less accomplished. In fact, it's an absolute joy to watch. Triad Stage has brought a classic musical to thrilling life, brushing away the cobwebs to deliver a truly dazzling production, and in so doing, cementing their status as one of the premiere highlights of Greensboro's downtown nightlife. My Fair Lady runs through May 5, 2013 at Triad Stage in Greensboro, with tickets starting at $10. For more information or to purchase tickets, visit www.triadstage.com or call the box office at 336.272.0160. Blu-ray Review | "A Man Escaped"
Blu-ray Review | "Killing Them Softly"